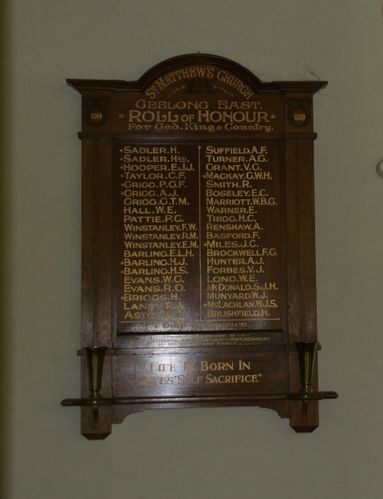 An honour roll commemorates those connected with the church who served in World War One. The honor board unveiled at the evening service was the gift of Mrs. Mackay and family, and is intended as the family's memorial to Mrs. Mackay's son, Pte. G.W H. Mackay, and two grandsons, Lieut. E. T. J. Hooper and Cpl. C. A. E. Mackay, who have fallen in battle recently. The board bears the names of 40 young men of St. Matthew's, who volunteered for the army: 12 have given their lives. Geelong Advertiser (Vic), 16 September 1918.